Today manicure – it’s not just the aesthetic component of the female image. 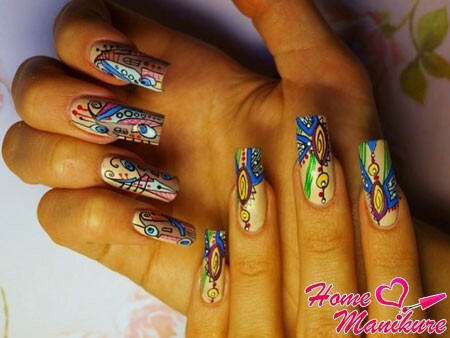 Beautiful nail art has become akin to the art: to create it using all kinds of tools and paints. 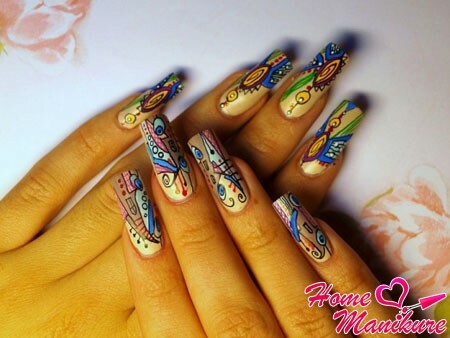 Professional light waved brilliantly writes on nails different patterns and designs. But what about the girls who do not know the special skills? To make a perfect manicure, not necessarily run to the salon to the master. There is a simple and affordable solution to the problem. Gel pen drawings on your nails will not yield to the beauty and elegance of the salon nail-art. A huge range of colour palette allows you to create the most incredible composition. 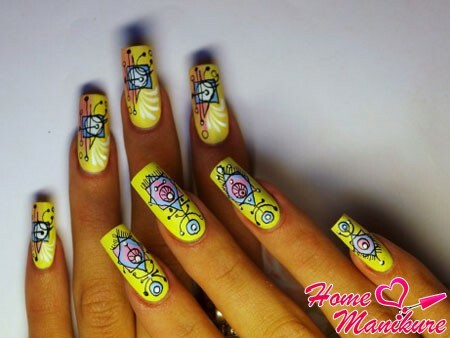 These drawings on the nails look very carefully and harmoniously. Nevertheless, it should be noted that the gel pen – not a panacea. Like any other tool for manicure, she has a number of distinct advantages and disadvantages.Next, we consider all the pros and cons of using colored rods in the nail-art. Due to the intricacies of the rod obtained filigree patterns and very sophisticated. With proper support working hand line in the composition lie perfectly flat. Gel pen is comfortable to use. It does not leak, does not require additional devices and paint itself is very easy to apply. Bright bars are affordable and sold at almost any stationery department. Despite all the advantages of gel pens, it has one major drawback. Coloured bars are not a professional product and, therefore, do not possess the necessary certificates of quality and safety . Even putting pictures on the dense layers of the base, you can not be sure of the harmlessness of the procedure for your health. Anyway, gel pen – a product of the oil industry, so do not exclude a certain degree of negative impact of paint on the nails and skin. Before proceeding to the manicure, you need to prepare to handle the procedure. Removing the excess skin on the nails in the cuticle area, as well as tips to file, you will attach Palchikov neat appearance. 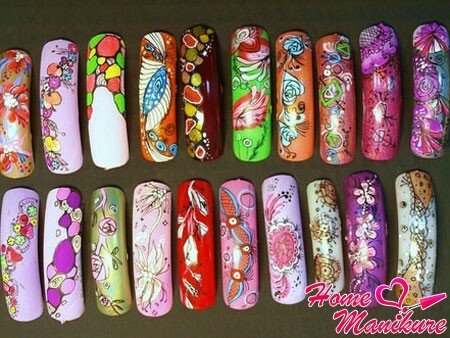 After preparatory activities you can go directly to the creation of nail art. Just a few steps, and beautiful design will decorate on your nails. The first thing to strike twice basecoat. Reinforced frame provides a great protection from bright pigment. Followed to make up nails coloured varnish in 1-2 layers. When the coating is dry, you can apply your gel pen drawings. Patterns that are not lubricated, it is important to wait at least 10-15 minutes to fix the paint. The final touch – a top coating. If during the drawings can not be obtained from the first time, you can remove them from the usual nail tissue. 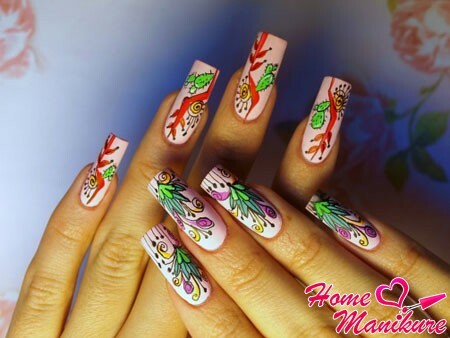 Future design, it is desirable to think in advance, or even better – to represent it on a piece of paper.As you can see, nail art gel pen with a very simple to perform and the power of even inexperienced girls.Ideas can come up with a manicure yourself or learn from our photo collection. Drawing on nails gel pen, you can easily embody your fantasies to life. Ease of execution manicure allows to fully enjoy the process and at the same time easy to get the desired result. Using gel pens on the nails can create soft gentle composition, as well as more precise geometric lines. The choice in favor of a particular design will depend on your desires and stylistic component of an image as a whole. A few photos to help you decide on the future pattern and inspire you to new experiments. In conclusion, we want to stress once again that the gel pen was not originally created for nail art, and therefore, there is no guarantee the safety of its use . We recommend to resort to such a design only in exceptional cases. Be sure to use some dense layers basecoat that the nails will provide some shield.